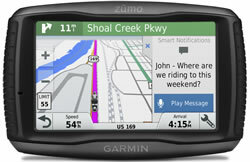 We retail Garmin and TomTom motorcycle sat navs with screen sizes that vary from 4.3-inch to 5-inch and preloaded mapping ranges from UK and Ireland to full European countries and world countries. 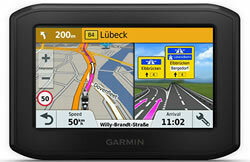 All systems include FREE lifetime sat nav map updates. 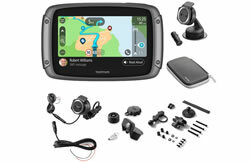 All motorcycle sat nav systems include the RAM mount and powered charging mount to get your started - straight from the box - when you buy from ActiveGPS. 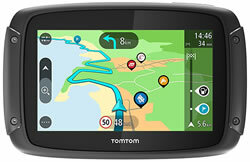 For further help on deciding the best motorcycle sat nav to buy for your needs or maybe as a gift for somebody else, please telephone 01733 777623 (Mon-Fri 9:30am-5pm) outside of these hours please e-mail us. 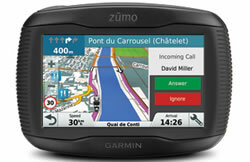 Cardo Scala Rider headsets are available to use on your motorcycle for multiple purposes. 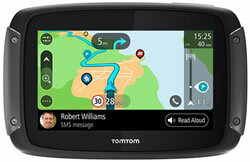 The benefits of buying and using a Scala Rider headset are three-fold; 1. you can listen to sat nav voice turn-by-turn instructions, 2. listen to music and 3. communicate with other motorcyclists whilst riding (using the intercom when within range and mobile phone when out of range).